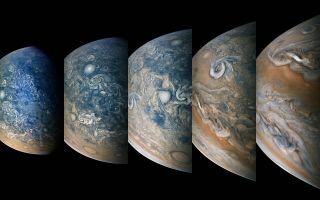 Four images of Jupiter taken over a 15-minute period in July 2018 show off the complicated dynamics of the atmosphere in the planet's northern hemisphere. A stunning series of photographs captured by NASA's Juno spacecraft highlights the complicated dynamics of Jupiter's atmosphere. The images, taken July 16 between 12:54 a.m. and 1:11 a.m. EDT (0454 and 0511 GMT) by the JunoCam camera on board NASA's Juno spacecraft, show the atmospheric features in Jupiter's northern hemisphere, NASA officials said in a statement when releasing the image yesterday (Aug. 27). Those features include an anticyclone storm marked by a white oval, most easily seen in the second image; a storm nicknamed the Little Red Spot, visible at the bottom of the second and third images; and an orange stripe called the North North Temperate Belt, visible in the last two images. The images were captured during Juno's 14th close skim over Jupiter's surface, when the spacecraft came as close as 3,900 miles (6,000 kilometers) above the planet's clouds. JunoCam is controlled by the public, and members of the public process the raw photographs from the camera and turn them into stunning images like these. The $1.1 billion Juno mission launched in August 2011 and has been studying the gas giant planet since July 2016. The spacecraft is due to remain at work for almost three more years, which means scientists can keep watching these atmospheric features as they change over time.